You only want the best for your eyes and EyeMed can help keep them healthy. You get personalized, quality eyecare and prescription eyewear from a doctor you can trust. Eyecare is important. But good health and clear vision don't just happen. With EyeMed coverage, you can keep your eyes healthy and get great savings on glasses, contacts, and laser vision correction. EyeMed is the comprehensive vision insurance plan offered by The Standard Insurance Company. Find a provider - Choose "ACCESS" as the Plan Network when searching for an EyeMed provider. 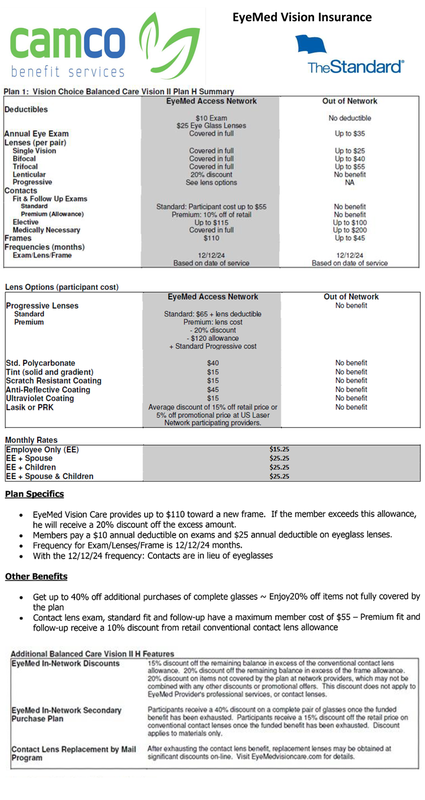 Your eye exam is covered every 12 months. EyeMed covers either prescription lenses or contact lenses once a year.